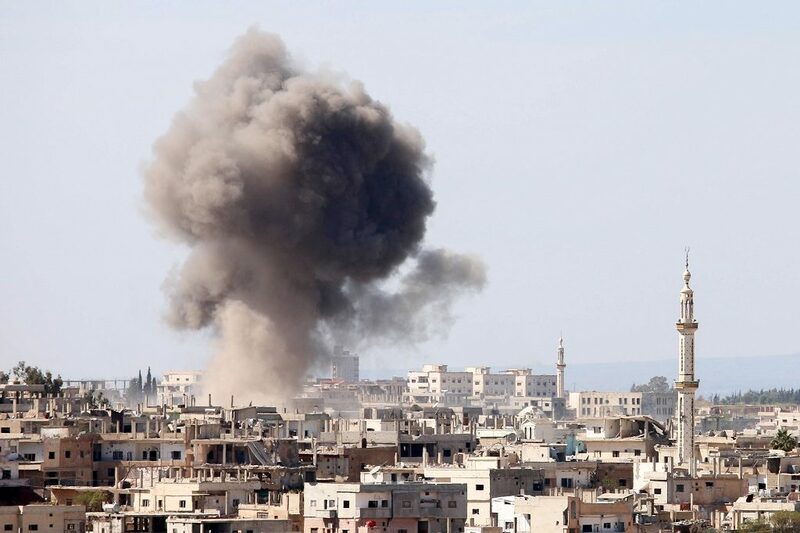 In the evening of Thursday, April 6 (early Friday morning in local time), the United States fired 59 cruise missiles at Syria’s Al Shayrat airfield in retaliation against the chemical strikes on Syrian people by Assad regime. Many people commended this move, from neocon hawks to “peace and love” millennials —before they retake their typical stance claiming the U.S. invaded Syria for oil. Many others—mainly libertarians—criticized this “U-turn” on Syria, advocating restraint when it comes to foreign policy. There is no need to worry that we are starting a new, costly war in the Middle East—or even World War 3. Compared with the 24,287 bombs U.S. dropped in 2016 in Syria and Iraq , mostly in routinely airstrikes against ISIS, the air strike on April 6 is not a big deal at all. It does not signal the start of a series of large military operations. In fact, its result will likely be a restricted, focused attack—a one-time operation against Assad. The reasons are simple: “no boots on the ground” has been an unchallengeable line with a broad consensus after costly lessons from wars in Afghanistan and Iraq to interventions in Libya; U.S. and Russia will both be cautious not to come close to direct conflicts. The limited scale of an air strike is a positive thing as it shows the world that American leadership is back. Trump actually enforces the red line on chemical weapons which, ironically, was drawn by Obama in 2013. The air strike will also send warnings to Assad as well as his Russian, Iranian and Chinese supporters. Trump chose this specific time for the strikes when he was dining with the Chinese President Xi Jinping, which demonstrates a strong psychological deterrence by showing the muscle of U.S. directly to his face. Syria is doomed to remain a fragmented, failed state no matter what U.S. does or does not do, since these conflicts are deeply rooted and have complicated social and historical implications. Actually, not a single side in the mess of Syrian Civil War is truly just. A real “good” power, which shows the potential to maintain basic orders for the region, has not emerged. So simply bidding on any side will only foster regret in the future. Too much intervention can only lead to heavy financial burdens, casualties of served men and women, and a broken American image—since it is unlikely to totally avoid civilian casualties when many Middle East powers are notorious for using human shields to play the victim card—which gives the international community even more excuses to blame America for problems in the Middle East. A reasonable way to gradually bring order to the region while limiting American involvement to encourage and support each respective ethnic and religious group to build their own nation states. Kurdistan is a good example. It rose as a de facto independent nation with stable economic growth and a reliable military power, bringing order to Northern Syria. Conflicts and despotism in Syria and Iraq come largely from the fake nation states themselves, since they forcefully bind many different groups of people into one nation. Additionally, Kurdistan’s different fate from other parts of Syria and Iraq during the past decade provides excellent proof that gaining independence is the first step towards peace and stability. If Kurdistan becomes a robust ally able to bring order to surrounding areas, it will necessarily share some responsibilities in fighting against terrorism and tyrannies nearby, which in result, will make it easier for other qualified groups to build their own independent nations. Then stability may come southward gradually, albeit slowly. Like the crystallization process in Chemistry, this wave of nation building may gradually expand and lead to a benign circle. And if successful, the refugee crisis will be solved. The U.S. only needs to provide critical help in the form of airstrikes on some challenging targets, training and technical support to make it easier for local people to build their nations and give them more incentives to cooperate with the U.S. We do not need to singlehandedly embark on nation building work in a society we are not familiar with, but rather to establish an incentive mechanism made of U.S. support and local self-determination. This spontaneous nation building process may have positive results while slashing military expenditures to a surprising degree. Of course, it would be a long and tough process and cannot succeed without broad cooperation, and will be a huge test to the virtues and “mores” of local people. After all, this is their problem.